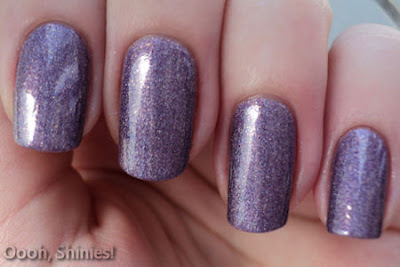 One of the new polishes that I got yesterday was Nubar Treasure. It looked nice in the bottle but when I put it on a nailwheel, it looked a lot like another color from a drugstore, Etos Effect Nails 010. They ain't the same, but in most light and especially from a distance you don't see so much difference. The Nubar is a bit brighter and smoother, the Etos has a bit of golden-like miniglitter, although those are more visible in the bottle than on your nails. Unfortunately there was no sun when I went to make pictures, but the little bit of holo in these polishes is kinda alike too. Here you see the bottles, I turned them around because the print on the Etos bottle makes it less visible. On my index/ring I wear 2 coats of the Etos polish, on my middle/pinkie I wear 3 coats of Nubar. The colors are a bit more like on the bottle pic. The coverage of the Etos polish was better, but removing it was less nice than the Nubar (some little sparkles that get stuck on your fingers). This is an older picture of the Etos polish.